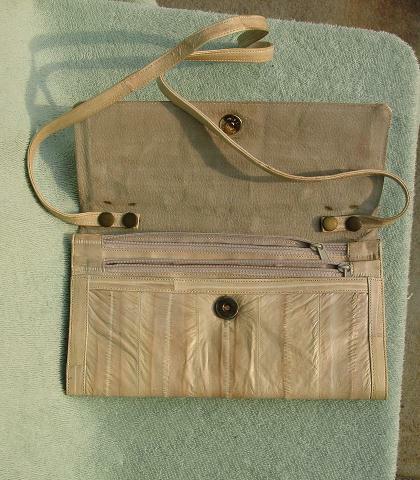 This vintage cream-beige eelskin purse has 5 sections, 2 of which are zippered. The main section is lined in gray suede and the adjoining section has gray suede on one side and a gray patterned fabric on the other side. The other 3 sections are lined in the gray fabric. It has a matching flat 34" detachable shoulder strap. There is a 5/16" light ink mark in the lower left corner of the front of the purse. 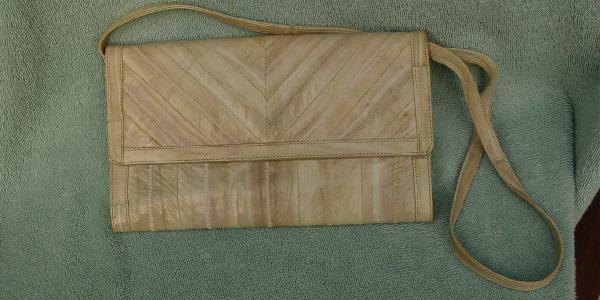 It came from a stylist's collection, and was held as a clutch by a model during a photo shoot.